Welcome back! And happy 75th birthday to Sly Stone, who gets things started today . . .
President Trump is scheduled to meet at the White House this afternoon with oil-and-gas industry CEOs on the executive committee of the American Petroleum Institute, the industry's biggest lobbying group. Why it matters: The meeting arrives amid unexpectedly deep tensions between the pro-fossil fuel White House and the industry, which is bristling over steel tariffs and worried about the fate of NAFTA, to name two flashpoints. My Axios colleague Amy Harder broke down the divisions in this recent column. The scene: Politico reports that API's board is holding a two-day meeting at Trump International Hotel in D.C. that started Wednesday. The meeting could involve up to 200 people paying to stay at the hotel, according to the story, which quotes ethics watchdogs criticizing the choice of venue. Solar power's growth slows in the U.S. Additions of U.S. solar power capacity fell last year from their record highs in 2016, and new tariffs on panel imports will mean slightly slower growth in years ahead than previously expected, a new industry report finds. New data: GTM Research and the Solar Energy Industries Association (SEIA) said that 2017 brought the addition of 10.6 gigawatts of new capacity, a 30% drop from the prior year (see chart above). What's next: The report forecasts a revival of solar growth through 2023, rising back above 15 GWs of new capacity that year. However, GTM has cut its 2018–2022 forecast by 13% due to the 4-year tariffs and corporate tax changes announced recently. Why it matters: Solar has been booming in the U.S., thanks to cost declines, state mandates, and other factors. Solar was the second-largest source of new generating capacity brought online last year behind gas, the groups said. But the industry faces headwinds in the Trump era — including tariffs and administration efforts to alter wholesale power market rules to benefit coal and nuclear. 2016 numbers reflected the burst of projects set in motion the prior year as developers rushed to use expiring tax credits (which were then extended in a late-2015 Capitol Hill deal). "Uncertainty" around the potential tariffs, which the White House eventually imposed early this year, prompted some project delays and cancellations, SEIA said. Norwegian oil giant Statoil isn't called Statoil anymore — as of today they're called "Equinor." The company's announcement calls it a "natural change as we develop from a focused oil and gas to a broad energy company." "'Equi' is the starting point for words like equal, equality and equilibrium. 'Nor' is signalling a company proud of its origin," they said. Why it matters: The removal of "oil" from the company name signals how oil-and-gas giants are seeking to reposition themselves at a time of increased emphasis on climate change. Several of the largest firms are are expanding their investments in low-carbon energy. Yes, but: Renewables, electric vehicle-related investments and other green energies are currently a very small part of the spending portfolios of major oil-and-gas companies. Go deeper: Reuters adds some good context here, noting that some other energy companies have also rebranded. "Like Shakespeare, what's in a name? ... That's the name we are given and by our shareholders. For us to meet the energy future, it's not a naming exercise. Mainly it's what we do. Nobody believes Apple is the best computer because of its name." New estimate: Via The Wall Street Journal, "Global oil demand will likely grow faster than expected this year, partly offsetting a surge in U.S. shale production and keeping the market in balance, the International Energy Agency said Thursday." Trade fallout: The Financial Times flags another interesting part of the monthly report. Their lede: "US president Donald Trump’s proposed tariffs on steel and aluminum imports risk a global trade war and could threaten rising oil demand growth, the International Energy Agency said on Thursday." Arctic policy: Via Argus Media, "The US Interior Department is targeting early 2019 to complete an environmental review of oil and gas drilling in the Arctic National Wildlife Refuge (ANWR) — a necessary step before it can hold two lease sales ordered by Congress." There's an interesting factoid in the Energy Information Administration's latest This Week in Petroleum report . 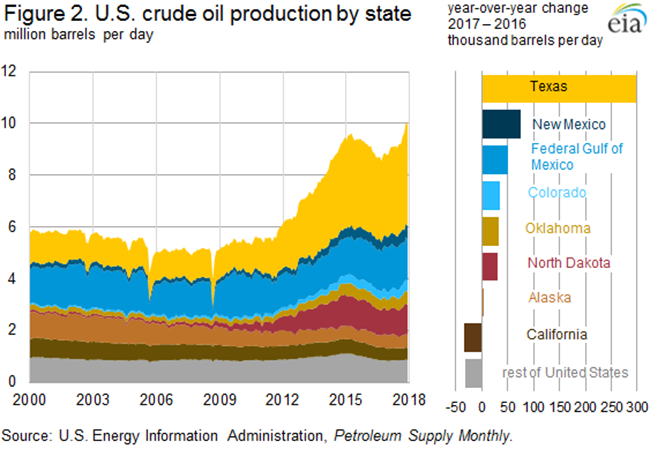 . .
"New Mexico surpassed California and Alaska to become the third-largest crude oil-producing state in the second half of 2017, although it produced less on an annual average basis," it states. Why it matters: While Texas gets lots of attention as the epicenter of the shale boom, it's a reminder that the prolific Permian Basin extends into New Mexico too. Why it matters: It’s the latest effort by the coal lobby and its allies to support economically struggling plants after the Energy Department’s efforts to boost their revenues through new power-market rules were rejected by independent federal regulators. Flashback: The coal lobby has been trying for months to get Congress to introduce this proposal, as Amy reported exclusively in this December column. More: Click here for the whole story. Not interested: Perry said Wednesday he's not interested in becoming the next head of the Department of Veterans Affairs, rejecting reports that he's being considered as a replacement for the agency's embattled secretary David Shulkin, per AP. Interested: Yesterday Perry praised the work of DOE's Advanced Research Projects Agency-Energy in videotaped remarks to the ARPA-E Energy Innovation Summit. Why it matters: The support is another sign that Perry does not agree with the White House proposal to kill off the DOE branch that funds R&D into breakthrough energy technologies. On the record: Perry will testify this morning before a House Appropriations subcommittee that's crafting spending legislation for the department. Warning: A new Moody's report sees credit risks to property/casualty insurance and reinsurance companies thanks to "significant exposure" to the economic damages of climate change. Why it matters: "Risks arise primarily from weather-related catastrophe exposures, potential claims on liability policies, and investments," Moody's said. But it's not all bad. "To a lesser degree, climate change also presents opportunities for firms to introduce new products and expand existing products," it adds. Big picture: The number of annual "catastrophe events" has generally trended higher in the last half century, though it's not linear. Insured losses have also been trending higher and were well above $120 billion last year. The catastrophic events are the combined tally of drought, extreme temperatures, floods, landslides, storms and wildfires. The increase in insured losses stems from climate change but also greater levels of insurance coverage where valuable stuff is built — there's been a "marked increase in the insured value of real estate and other assets in exposed areas." The report says climate change is a problem for the industry because it adds an "extra layer of risk modeling and pricing uncertainty." Legal exposure too: Another challenge is that insurance companies' corporate clients face courtroom risks. "(Re)insurers are exposed to potential losses from liability insurance provided to corporations that face litigation alleging damages resulting from carbon emissions, and from companies’ failures to disclose the risks of climate change," Moody's said. Listen deeper: You can hear a short podcast with the report's authors at this link.